Platelet volume heterogeneity has been recognized by haematologists for over 100 years (Bizzozero 1882; Olef 1936). Despite this, the aetiology and the significance of platelet volume heterogeneity continues to be a controversial subject. 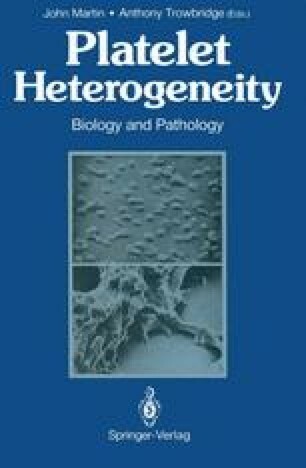 Several years ago our laboratory developed a technique for the separation of platelets into size-dependent subpopulations using counterflow centrifugation (Thompson et al. 1982). Using this newly devised cell separation technique, we have been able to address a number of questions concerning the aetiology and significance of platelet volume heterogeneity. Platelets separated into size-dependent subpopulations contain platelet granular contents in direct proportion to their volume (Thompson et al. 1982, 1983a). The intrinsic function of size-dependent platelet subpopulations is similar when function is measured as a percentage of granular contents that are released following activation by any of a variety of platelet agonists (Thompson et al. 1983a). However, because of the volume-dependent differences in the absolute amounts of intrinsic granular and membrane components, the ability of platelets to affect each other and their environment as measured by aggregation and total amounts of granular contents released is proportional to their size. These results confirmed that platelet volume correlates with absolute platelet function (Mannucci and Sharp 1967; Karpatkin 1978).